Joys of Ramazan 2016 at Hajvery University (HU)! | HU Campus Beat Blog! Home Campus News Joys of Ramazan 2016 at Hajvery University (HU)! 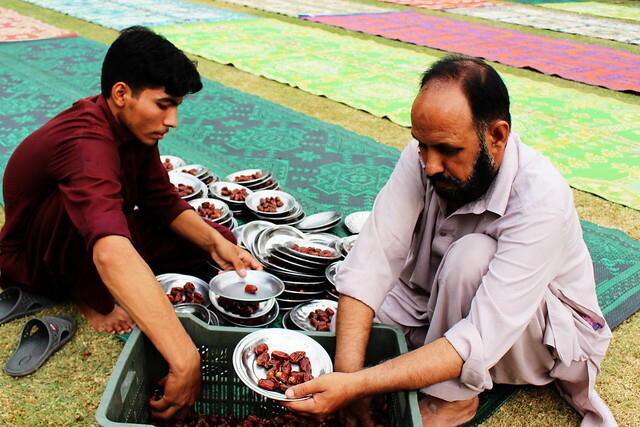 Ramazan is a month of blessings for Muslims world over, at HU itâ€™s even more special as the University arranges an Iftari for All every day during the holy month. About a thousand people gather at HU Main Campus from surrounding areas and break fast together, followed by Magrib jamaat and Dinner. It’s almost magical to view the sight of so many people enjoying Ramzan together at HU. Corporate Social Responsibility is a foundation stone of Hajvery University, we believe charitable causes complete us a Human beings, therefore during the holy month the University Management increases itâ€™s efforts to help the less privileged cope with the ongoing tough socio economic times in Pakistan. Members of the Faculty, and Students are welcome to join the Management & Staff of the University to take this opportunity to serve the communities we work in. May Almighty Allah accept our humble efforts and give us the strength to increase our efforts multifold, inshAllah.